Launched in late 2013, the littleBits Synth Kit lets you snap together the different components of a synthesizer into an extremely minimal modular instrument. Today, littleBits is adding three new modulates to its lineup, allowing its toy synth to connect with other musical tools like, uh, your computer. For those unfamiliar, littleBits is a modular electronics platform that lets you build up complicated circuits from individual electronic building blocks. The blocks are tiny self-contained circuit boards that snap together with magnets. It's fun with electronics without all the messy (and dangerous!) soldering. The synth kit was designed in partnership with legendary electronic instrument company Korg. The kit ships with a many of the standard elements of a a real synth rig, like oscilators, filters, a sampler, and a keyboard. All of the electronics designs are supposedly simplified versions of real Korg circuits. The synth makes some gnarly sounds but the only way to access it for now was through a headphone jack. No longer. 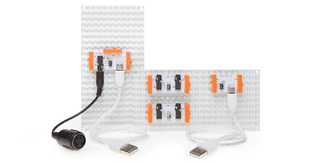 littleBits now offers three new modules: MIDI I/O, USB I/O, and CV (control voltage). The MIDI I/O and USB I/O modules let you send and receive signals to or from the compatible external component of you choosing—like your computer or a controller like a MIDI keyboard. The CV module is actually designed for connection to older-style analog components that use voltage to speak to each other. So if you were dying to incorporate your synth kit creations with your big-boy modular rig, that's an option now too. If you don't know what any of that means, don't worry: littleBits is all about learning and the company has put together a series of videos on its YouTube channel explaining how the new modules work. "Toy synths" are becoming increasingly popular because despite some of their limitations, they can be practical tools for experimentation. Constraints are a good thing! There's nothing more frustrating than infinite possibilities. Still, the synth kit was maybe a tad too limited before. It was hard to share the stuff you actually made with it. The new I/O helps.